Preprints (earlier versions) of this paper are available at http://preprints.jmir.org/preprint/10930, first published May 31, 2018. Background: The use of mobile health (mHealth) apps in clinical settings is increasing widely. mHealth has been used to promote prevention, improve early detection, manage care, and support survivors and chronic patients. However, data on the efficacy and utility of mHealth apps are limited. Objective: The main objective of this review was to provide an overview of the available research-tested interventions using mHealth apps and their impact on breast cancer care. Methods: A systematic search of Medline, PsycINFO, Embase, and Scopus was performed to identify relevant studies. From the selected studies, the following information was extracted: authors, publication date, study objectives, study population, study design, interventions’ features, outcome measures, and results. Results: We identified 29 empirical studies that described a health care intervention using an mHealth app in breast cancer care. Of these, 7 studies were about the use of an mHealth application in an intervention for breast cancer prevention and early detection, 12 targeted care management, and 10 focused on breast cancer survivors. Conclusions: Our results indicate consistent and promising findings of interventions using mHealth apps that target care management in breast cancer. Among the categories of mHealth apps focusing on survivorship, mHealth-based interventions showed a positive effect by promoting weight loss, improving the quality of life, and decreasing stress. There is conflicting and less conclusive data on the effect of mHealth apps on psychological dimensions. We advocate further investigation to confirm and strengthen these findings. No consistent evidence for the impact of interventions using mHealth apps in breast cancer prevention and early detection was identified due to the limited number of studies identified by our search. Future research should continue to explore the impact of mHealth apps on breast cancer care to build on these initial recommendations. Mobile health (mHealth) is a method to deliver health care or related services through portable devices  and is broadly accessible and often freely delivered in the app stores of app providers. The online app market is open to developers and allows them to sell or provide their apps free of charge. The current estimates suggest that there are more than 40,000 mHealth apps . According to a recent report by Grand View Research, Inc., the global mHealth market is expected to reach US $111.8 billion by 2025, and there is a growing need to reduce long waiting periods to access health care services, which is the primary driver responsible for the adoption of mHealth . mHealth apps are extremely relevant for both industrialized nations and developing countries, as they provide extended access to health care and health-pertinent information in a cost-effective way . Scholars and health care professionals have shown interest in this new technology, and the use of mHealth in clinical settings is increasing widely . Recent reviews showed that in cancer care, mHealth apps have been employed to promote prevention, improve early detection, manage cancer care, and support cancer survivors [5,6]. Furthermore, research-tested apps offer the unique possibility of providing accessible information and education at minimal costs throughout the cancer care continuum . Despite their impressive and promising potential, the utility and effectiveness of this e-health technology remain unclear. Scholars have reviewed the use of mHealth apps in several fields [4,7-10]. Mobasheri et al  reviewed 158 mHealth apps for breast cancer and found that there is a lack of evidence on their utility, effectiveness, and safety. Most mHealth apps lack expert involvement and do not adhere to relevant medical evidence or reflect patients’ needs . In addition, given the large number of available mHealth apps, it seems unrealistic to test each app thoroughly and scientifically before its release [4,5]. A recently developed mHealth app had negative effects on patients, augmenting their anxiety after breast cancer surgery . The mHealth app aimed at providing extensive information to patients; however, the control patients, who did not use the application, had lower anxiety levels than the test patients, which correlated to higher quality of life in the former group . The possibilities to enhance positive health outcomes and promote patients’ feelings of control over their health through the use of mHealth technology should be fully explored and tailored to patients’ needs [13-15]. Scholars and stakeholders advocate for more medical professional involvement, inclusion of patients’ preferences, and specific regulations . The need for integration between research-tested and privately developed mHealth apps has been widely stressed, as such integration plays a crucial role in achieving the necessary fundamentals of effective, evidence-based care [10,16,17]. Research should provide a scientific basis to build elements that can be effective for patient care. It is especially important to know which mHealth app has been scientifically tested and provides an overview of the interventions using mHealth apps. Our focus is on mHealth apps in breast cancer care. The present review aimed to provide an overview of the available evidence on research-tested interventions using mHealth apps in breast cancer care. Our findings aim to provide valuable information to health care professionals, mHealth apps developers, breast cancer patients, and other stakeholders on the characteristics of existing research-tested apps used in breast cancer care, including their advantages and pitfalls, in order to correctly, effectively, and safely support breast cancer patients. An extended bibliographic search was conducted in the Medline, PsycINFO, Embase, and Scopus databases. The following search string was used: ((phone OR mobile OR smartphone*) AND (app* OR application*)) AND ((breast* OR mammary) AND (cancer* OR neoplasm* OR carcinom* OR tumor*)). The search was limited to studies published from January 2008 (when the first mobile phone app was created) to September 2018. The review was registered in PROSPERO with the registration number CRD42017056239. All detected articles were screened according to the following inclusion criteria: original studies, English language, studies that include the use of an mHealth app, studies that include patients’ use of an mHealth app, and studies that concern the prevention/detection/care management/survivorship of breast cancer. We excluded studies that used websites, text messaging, emails, or other technological interventions that did not include mobile apps and studies that used mobile apps without applying them to breast cancer patients (eg, health care professionals that use mHealth apps). A data-extraction form was developed on basis of the Centre for Reviews and Dissemination templates . Two reviewers independently extracted the data from the included studies by using the extraction form. Disagreements in data extraction were resolved through discussions between the authors until an agreement was reached. Relevant articles were then selected by cross-examining and reviewing the articles. Data collected included information on authors, publication date, intervention’s features, study design, sample size, outcome measures, and results. The quality of the quantitative studies was evaluated independently by two researchers using the Effective Public Health Practice Project Quality Assessment Tool for Quantitative Studies . This tool provides a standardized means to assess the quality of a quantitative study, leading to an overall methodological rating of strong, moderate, or weak in eight sections: selection bias, study design, confounders, blinding, data-collection methods, withdrawals and dropouts, intervention integrity, and analysis. The quality of the qualitative studies was evaluated using the Joanna Briggs Institute Critical Appraisal Checklist for Qualitative Research . This instrument is underpinned by a multi-dimensional concept of quality in research, and the 10 items assess quality according to several domains including quality of reporting, methodological rigor, and conceptual depth and bread. Discordances in quality rating were resolved through discussion between the researchers. The results of the systematic search are summarized in Figure 1 in accordance with the Preferred Reporting Items for Systematic Reviews and Meta-Analyses . We identified a total of 256 articles (100 from Medline, 9 from PsycINFO, 230 from Embase, and 129 from Scopus), from which we excluded 212 duplicates. Abstracts and titles were screened to identify articles discussing an intervention using an mHealth app for the care of patients with breast cancer, and 69 such articles were found. Further screening on the basis of the entire text according to our inclusion and exclusion criteria led to a final selection of 29 articles. The 29 studies identified were published between 2011 and 2018. Majority of the studies (n=12) focused on apps for breast cancer care management, 10 focused on survivorship, and 7 focused on prevention and early detection. Ten of the 29 studies were randomized controlled trials, 8 were prospective cohort studies, 7 were cross-sectional studies, and 4 used qualitative analysis. Using the Quality Assessment Tool for Quantitative Studies , 10 studies were rated as strong; 9, as moderate; and 6, as weak. The 4 qualitative studies assessed using the Critical Appraisal Checklist for Qualitative Research  revealed a methodological quality that allowed their inclusion in the review. Two of the 29 studies focused on the use of an mHealth app in breast cancer prevention, 5 targeted early detection, 12 were on care management, and 10 focused on survivors of breast cancer. The sample included in the studies comprised adult patients in different countries with different ethnic backgrounds: 14 studies in North America, 8 in Europe, and 6 in Asia. Table 1 provides a summary of the features of the included studies. Figure 1. Flow diagram of identification, screening, eligibility, and inclusion of studies. Harder et al  (2017) To optimize self-management of arm and shoulder exercises for upper-limb dysfunction after breast cancer treatment N=3 8 weeks; Measurement at the end of the study bWell is an evidence-based program providing progressive exercises for passive and active mobilization, stretching, and strengthening. Buscemi et al  (2018) To increase health-related quality of life in Hispanic breast cancer survivors N=25 4 weeks Intervention delivered through MyGuide app, focused on enhancement of psychosocial adaptation after breast cancer; cancer knowledge; stress awareness and management; social support; and communication with friends, family, and oncology providers. Lengacher et al  (2018) To improve psychological and physical symptoms of depression, anxiety, stress, fear of recurrence, cognitive functioning, sleep, fatigue, pain, and quality of life N=15 6 weeks; Measurements at baseline and at 6‐week follow‐up The mMBSR(BC)e providing a 2‐hour session intervention weekly for 6 weeks via iPad. aA detailed table showing features of the extracted studies is available in Multimedia Appendix 1.
bThe quality of the study was rated using the Effective Public Health Practice Project Quality Assessment Tool for Quantitative Studies  and the Joanna Briggs Institute Critical Appraisal Checklist for Qualitative Research . cIBIS: International Breast Cancer Intervention Study. dEORTC-QLQ-C30: European Organization for Research and Treatment Cancer Quality of Life Questionnaire - Core 30.
emMBSR(BC): mobile Mindfulness-Based Stress Reduction for Breast Cancer. fFACT-G: Functional Assessment of Cancer Therapy - General. gEORTC-BR23: European Organization for Research and Treatment Cancer Quality Of Life Questionnaire - Breast Cancer Module. Table 1. Description of the characteristics of the studies presented in the reviewa. We identified 7 papers in the area of breast cancer prevention and early detection [22-28]. Hartman et al  designed a randomized study to test a weight-loss intervention to reduce the risk of breast cancer. The intervention combined technology-based self-monitoring apps with individualized phone calls. In particular, the intervention entailed an electronic calorie-counting tool, an accelerometer-based activity meter that provides real-time feedback of the number of steps taken and minutes of moderate-intensity activity, and 12 phone calls (30 minutes each) over the 6-month intervention period. After 6 months, the 36 participants in the experimental group had lost significantly more weight and a greater percentage of starting weight than the control group. SnapChat, a social networking mobile app used to deliver educational material on breast cancer through videos, texts, and pictures, increased breast cancer awareness among female students in the Dammam region of Saudi Arabia . Eden et al  studied decisional conflict and self-efficacy in 75 women before and after the use of a mammography screening decision aid in the form of an mHealth app and showed that the use of the mHealth app decreased the decisional conflict and increased the decisional self-efficacy. Heo et al  developed an mHealth app to encourage breast self-examination. The mHealth app included a breast self-examination reminder, a record-keeping function, and educational features. After using the app, the number of participants who practiced breast self-examination increased from 28 to 32. However, participants below the age of 30 years performed a significantly higher number of breast self-examinations and more appropriate self-examinations than participants aged above 30 years. An mHealth app developed to convey risk information to patients attending a high-risk breast cancer clinic resulted in increased accuracy in risk perception compared to standard risk counselling . Lee et al  tested the efficacy and feasibility of mMammogram, an intervention entailing tailored multimedia messages to increase knowledge and awareness and promote mammogram screening among Korean-American immigrant women. The intervention group showed greater knowledge of breast cancer and screening guidelines, readiness for mammography use, and greater satisfaction with the intervention. At the 6-month follow-up, 75% of women who received the mMammogram intervention completed the mammograms compared to 30% of the women in the control group. Focus groups with women in the intervention group supported the fact that mMammogram enhanced the understanding of breast cancer and screening through mMammogram and that health navigators promoted free or low-cost mammograms and scheduling of mammogram appointments . A total of 12 papers investigating the use of mHealth apps in breast cancer care management emerged from our review and focused on care management and monitoring of treatment side effects [29-33]; personal data management ; psychological aspects, social support, and health-related quality of life [35-38]; physical activity ; and educational aspects . The mHealth apps that included the monitoring and care management of treatment side effects covered wound monitoring , sleep quality collection , daily functional activity stabilization , mental health tracker , and chemotherapy dose adaptation . These apps were developed for and focused on reliable collection and communication of relevant breast cancer data from patients and oncologists. In the Hwang’s study , a postoperative wound e-monitoring app significantly decreased the number of readmissions to the hospital, unscheduled visits to the emergency department, or walk-in clinic visits. The mHealth app intervention is a virtual care platform that consists of a mobile phone app and secure password-protected online account that allowed patients to take a photo of their wounds postoperatively, attach the photos to electronic messages, and send them to the surgeon using the mobile phone app. The surgeon then responded to each patient’s message within 24 hours. A vast majority (95%) of patients felt that electronic wound monitoring improved their care and would recommend such technologies to a friend or colleague. Min et al  analyzed the feasibility of and compliance with an mHealth app for collection of sleep disturbance-related data from breast cancer patients receiving chemotherapy. Participants self-recorded three health experiences—sleep-disturbance symptoms related to mild depression, acute symptoms related to cytotoxic chemotherapeutic agents, and medication diary for antihormonal treatment—that may be caused by breast cancer diagnosis and treatments. The overall compliance during the 90-day longitudinal collection of daily self-reporting of sleep-disturbance data was approximately 45%, confirming the feasibility of the intervention; women without any form of employment exhibited a higher compliance rate. No other association between patient characteristics and compliance was found. An intervention using an mHealth app on patient-reported daily functional activity in both supervised and unsupervised settings showed that the use of the mHealth app in collaboration with physicians was associated with stabilized daily functional activity and fewer and more precise entries than the unsupervised use of the mHealth app. The mHealth and Web app allows patients to record daily functional activity or symptoms with an indication of severity . Kim et al  evaluated the validity and screening performance of an mHealth app for depression, which collected self-reported mental health ratings from patients with breast cancer. The app tracked three mental health indicators for depression (sleep satisfaction, mood, and anxiety) daily, and the results strongly supported the potential of a mobile mental health tracker as a tool for screening depression in patients with breast cancer. An mHealth app developed to collect and monitor real-time symptoms in patients receiving oral chemotherapy showed that both patients and oncologists felt reassured by the use of the mHealth app . In the intervention, patients were required to complete a symptom, temperature, and dose diary twice a day using an mHealth app. This information was encrypted and automatically transmitted in real time to a secure server, with moderate levels of toxicity automatically prompting self-care symptom-management messages on the screen of the patient’s mHealth phone or in severe cases, a call from a specialist nurse to advice about care according to an agreed protocol . Klasnja et al  tested the feasibility of an mHealth app for data management. The mHealth app included a web component and a mobile component. Using the mHealth app, patients could create, edit, and view the full range of information stored in the website and share them with family members and health care professionals. In addition, patients could create photo, audio, and text notes to quickly capture information and immediately link those notes to related appointments. The mobile app synchronized the app calendar to the phone’s native calendar app, allowing patients see their care events alongside their other commitments. Their study highlighted an empowering effect of mHealth analysis. Harden et al  developed bWell, a mobile phone application intervention to optimize self-management of arm and shoulder exercises for upper-limb dysfunction after breast cancer treatment. User testing demonstrated ease of use along with clear, engaging, and motivating content. Zhu et al explored the effectiveness of Breast Cancer e-Support, an app-based program, to address women’s self-efficacy, social support, symptom distress, quality of life, anxiety, and depression [35,36]. The app-based intervention was found to be more effective than usual care in promoting women’s self-efficacy and quality of life and decreasing symptom burden during chemotherapy. The mHealth app did not show any advantage over usual care in terms of social support, symptom severity, anxiety, and depression. In addition, the beneficial effects were not sustained at the 6-month follow-up . Analyzing qualitative interviews, Zhu et al  highlighted that participants perceived the program to be helpful in enhancing knowledge, improving confidence level, and promoting emotional well-being. The most prominent benefit was access to tailored advices from experts, whereas the barriers to use were the physical or psychological health status and app instability. Participants suggested implementing message reminders and a search engine to add more interesting and practical knowledge and updating the information more often. The use of a mindfulness meditation training delivered through a commercially available mindfulness app called Headspace that uses audio and animated video improved quality of life and decreased physical and psychological distress . Wallweiner et al  analyzed the reliability of a tablet-based measurement app for the European Organization for Research and Treatment Cancer Quality of Life Questionnaire - C30, a measure of health-related quality of life in patients with metastatic breast cancer. The electronic version of this measure was reliable for patients with both adjuvant and metastatic breast cancer, showing a high correlation in almost all questions of the questionnaire. Foley et al  educated patients about breast cancer surgery by using an mHealth app that provided information on the surgery procedure tailored to individual patients. They found that at 7 days after surgery, participants who were more educated about their breast cancer surgery procedure experienced more anxiety than the control participants. In this review, we identified 10 studies focusing on the use of mobile phone apps among breast cancer survivors. All 10 studies aimed at assessing lifestyle changes, in particular, improving physical activity and reinforcing weight loss [40-46]; reducing stress ; improving health-related quality of life [46,48]; and providing information, support, and attention for psychosocial issues . Of the 10 studies, 4 found significant effects of the mHealth apps on weight loss [41-43,46]. McCarroll et al  assessed a 1-month lifestyle intervention using a Web and mHealth weight-loss app called LoseIt! This intervention placed emphasis on the nutritional quality and physical activity and showed significant reductions in body weight and improvements in eating self-efficacy. Uhm et al  tested and compared a 12-week home-based program of aerobic and resistance exercises using a mobile phone exercise app and a pedometer with a conventional exercise program using a brochure. Physical function, physical activity, and quality of life significantly improved regardless of the intervention method, and changes were not significantly different between the two interventions. The feasibility and preliminary efficacy of two self-regulation interventions using the mHealth app and website as well as tailored feedback emails to prevent weight gain among African-American breast cancer survivors were evaluated . The interventions focused on daily self-weighing and used objective monitoring and tailored feedback about weight and physical activity. Both the interventions were successful in controlling weight, and both intervention groups indicated highly positive perceptions about the intervention; in addition, 100% of participants would recommend the program to other breast cancer survivors. Preliminary findings of an intervention combining the use of a mobile phone app and Facebook-delivered health education material showed an increase in physical activity and decrease in weight and body fat percentage . Fazzino et al  performed a thematic qualitative analysis and identified themes related to successful weight loss in breast cancer survivors undertaking a group phone-based weight-loss intervention. Examples of themes that emerged are the importance of being part of a group and internal motivation. BENECA mHealth, an application for remotely assessing and monitoring energy balance in breast cancer survivors, showed positive agreement with daily, 24-hour dietary recalls and accelerometer data . Ainsworth et al  assessed the acceptability of a 5-day trial of a mobile phone app for measuring time use in order to inform physical activity measurement and promotion interventions. Majority of the participants agreed that learning to use the app was easy, and most preferred to use the app over the paper-and-pencil diary method of record. The 6-week mindfulness-based stress reduction for the breast cancer program delivered via a tablet proved to significantly improve the psychological and physical symptoms of depression, state anxiety, stress, fear of recurrence, sleep quality, fatigue, and quality of life . Buscemi et al  pilot-tested a mobile phone-based intervention to boost health-related quality of life in Hispanic breast cancer survivors in the United States. Participants’ knowledge on breast cancer and health-related quality of life increased over the course of the 4-week intervention. A mobile phone app combined with a social media-delivered health behavioral change intervention promoted the improvement of several physiological, psychosocial, and quality of life outcomes over the course of 10 weeks . For example, it improved physical activity and the ability to engage in social roles . The blended care intervention My-GMC, which combines a face-to-face group medical consultation with an online app, positively influenced provision of information, support, and attention for psychosocial themes. However, no significant effects on psychological distress and empowerment were observed as compared to usual care . Considering the increasing number of mHealth apps available to patients and their increasing use in breast cancer care, it is important to understand their effects. Therefore, we conducted a systematic review on studies that scientifically tested interventions using an mHealth app for breast cancer care. We identified a total of 29 studies, which encompassed important phases in breast cancer care and addressed prevention and survivorship. Overall, the results of the studies on the mHealth apps for breast cancer care were promising. Majority of the identified studies in patients’ care management showed a positive impact of the use of mHealth apps. Many hopeful opportunities offered by the mHealth apps rely in the amelioration of the communication process between patient and doctors, favoring an effective exchange of information [33,34]. Positive effects of mHealth-based interventions on health-related quality of life [36,38] and stress reduction  have been reported among patients receiving treatment. However, the role of mHealth-based interventions in the psychological impact of treatment is unclear. Only two studies addressed this topic [12,36] but showed no advantage of social support, anxiety, and depression  and highlighted an alarming detrimental effect of providing educational material about surgery treatments on patients’ anxiety levels . The number, quality, and findings of studies identified by our search highlight the fact that mHealth technology may play a relevant role in the care of breast cancer survivors. Evidence points to a positive effect of mHealth-based interventions on promoting weight loss [41-43,46], stemming stress, and sustaining the quality of life [44,46,48,49]. However, no convincing data are available on the benefit of mHealth for enduring adverse psychological sequel [46,49]. The restricted number of studies and methodological differences partially account for the heterogeneity of results. mHealth technology may result in interesting opportunities to improve the lifestyle of individuals at risk of breast cancer and support the spread of knowledge and awareness of breast cancer. However, there is no consistent evidence of the impact of interventions using mHealth apps in breast cancer prevention and early detection due to the limited number of studies identified by our search. Despite the high quality of the studies, only one study considered an mHealth-based intervention in breast cancer prevention , and therefore, no strong conclusion can be drawn. Several aspects have to be considered, as they may limit the generalizability of our results. The heterogeneity in the focus of the included studies may affect the strength of our results and conclusions. Regarding the design and quality of the studies included in our study, a considerable number of studies were feasibility or pilot studies [25,32,33,41,43], which restricted the strength of their results. The data indicate that more evidence is needed to clarify the benefit of mHealth technology for breast cancer care. 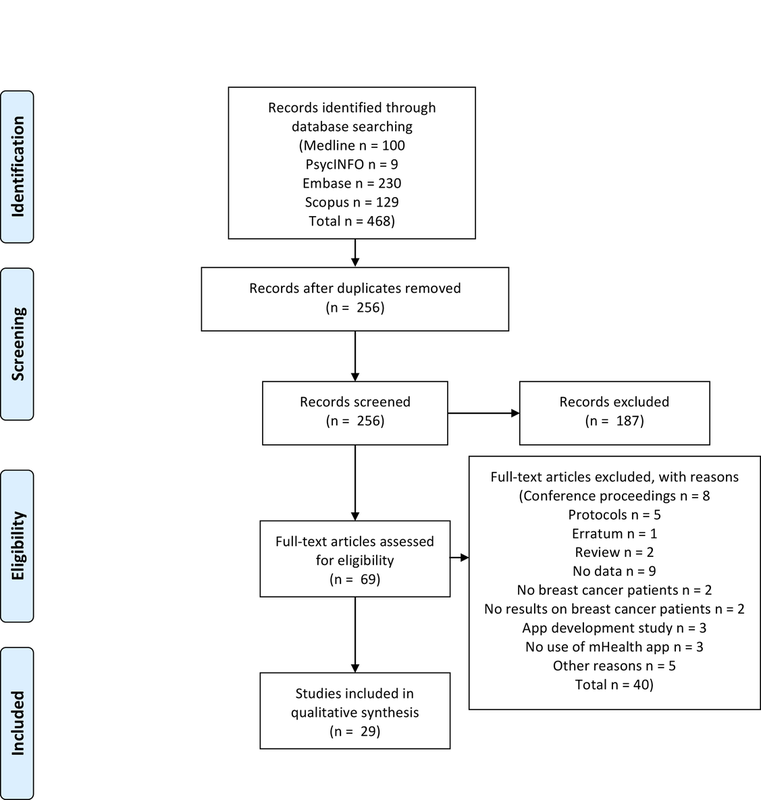 Examples of the need for more evidence are provided in the studies of Foley et al  and Heo et al , who found that the effects of their mHealth apps were contrary to what they intuitively expected based on the literature on the effect of education in managing treatment side effects and facilitating adaptation in women with breast cancer [50,51]. Foley et al  hypothesized that more information regarding breast cancer would decrease anxiety levels before and after breast cancer surgery. However, their preliminary results showed that women who used the mHealth app experienced higher anxiety levels at 7 days after the surgery than women in the control group. Similarly, Heo et al  hypothesized that the use of the mHealth app would augment women’s intentions to regularly perform breast self-examination. This appeared to be true only for women younger than 30 years of age. In contrast, in women older than 30 years, the intention to perform a breast self-examination decreased. A possible explanation of these results may lay in the study design, the sample size, the method used to deliver the program, or the outcomes’ measures. Despite the aforementioned limitations, the present study shows promising results for the inclusion of mHealth apps in breast cancer care, but also calls for caution when implementing interventions using mHealth technology. The effects of using mHealth apps in the field of breast cancer are only recently explored and may be unpredictable. Few evidence-based interventions are described in the literature, and therefore, there is a need for good-quality clinical studies to guide future implementations. Our considerations build upon previous evidence highlighting the need for strict regulations in this field and a solid integration between privately tested and research-tested mHealth apps [4,6]. Breast cancer patients should, at all times, be safely assisted with regard to effective management of their health. Therefore, apps need to be extensively research tested before making them available to the public. Scientifically sound data are needed to draw strong conclusions on the utility, effectiveness, and safety of mHealth apps in breast cancer care. Description of the characteristics of the studies presented in the review. Aitken M, Gauntlett C. Patient apps for improved healthcare: from novelty to mainstream. Parsippany (NJ): IMS Institute for Healthcare Informatics; 2013. CRD’s Guidance for Undertaking Reviews in Health Care. Layerthorpe: University of York, Centre for Reviews & Dissemination; 2009. Joanna Briggs Institute Reviewers' Manual edition 2014. Adelaide: The Joanna Briggs Institute; 2014. Hwang H. Electronic wound monitoring after ambulatory breast cancer surgery: Improving patient care and satisfaction using a smart phone app. BCMJ 2016;58(8):448-453. ©Chiara Jongerius, Selena Russo, Ketti Mazzocco, Gabriella Pravettoni. Originally published in JMIR Mhealth and Uhealth (http://mhealth.jmir.org), 11.02.2019.